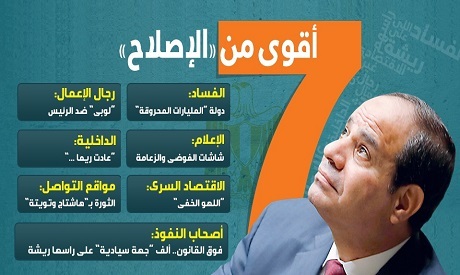 Egypt's privately-owned daily newspaper Al-Watan was forced to stop the release of its Monday print edition over a front page story titled “Seven [state and economic players] stronger than [President Abd El-Fattah] El-Sisi,” sources at the newspaper have told Ahram Online. The paper reportedly had to change the title of the report to “seven stronger than reform", before it was allowed to reprint. It is not clear what stage printing had reached at the time of the decision, and whether any copies of the original print edition were lost as a result. The paper has not released an official statement about the incident. An image of Al-Watan's original front page for Monday's special third anniversary edition went viral on social media. The report claimed that seven groups in Egypt hold “stronger” powers than the president. The paper said these were the interior ministry, the media, "corrupt individuals" who have cost the state “billions in wasted pounds”, the "secret economy", people of influence who behave “above the rule of law”, and businessmen who “lobby against the president." It is unclear what prompted the decision to stop publication of the original print edition. The original issue also reportedly contained a column by the paper’s managing editor Alaa El-Ghatrify titled “An officer, son of the palace, writes”. In the column, El-Ghatrify charged that the authorities had created a fake writer in one newspaper to write columns supporting the government as part of its effort to exert influence on the public through media. The column does not appear in the reprinted edition. Mahmoud Kamel, a member of the Journalists Syndicate, described the incident as “unconstitutional", calling it a violation of articles 70 and 71 of the constitution, which “guarantee freedom of the media and prohibit any form of censorship”. In March, Al-Watan was also forced to change the content of one of its issues, after it had planned to run an investigative report suggesting that certain state institutions were implicated in tax evasion. Last month, reports criticising police violence and the mistreatment of detainees were published in a number of local papers, but no issues were confiscated. Egypt's interior ministry however took legal action against newspapers El-Dostour and Al-Masry Al-Youm after they ran features on police brutality. Changing the title of a story is not limiting freedom of press. The title was indeed needlessly inflammatory. Perhaps later on when there is more stability such titles can be printed. As for the other column, we do not know if the story was based on credible sources, if it was not, then it deserved to be pulled. I agree completely, as I don't think that it has to do with freedom of press to cause damage to others intentionally. There must be a limit to freedom of expression, unłess the intentions are positive, I don't think that Egypt is in the situation to allow dirty stories to make the round, regardless of what others think, you are either with the new government or against it, then you pay the consequences. Does really anyone think that Egypt is ready for so called democracy? I don't think so and I live here, to any people don't understand it, that they would only complain and complain. Help your government to build a new Egypt and hope that our children will be able to live in a proper democratic way without abusing it. The de age of Egypt did not happen over night, it's taken generations to cause such damage and the poorest pay for it. It also takes another generation to create prosperity and a welfare estate. Klaus. Your tone sounds tough by sayaing if you dontIf you help this current fascist regime of Egypt, you are helping it to kill innocent civilians and rob the freedom of the Egyptians.